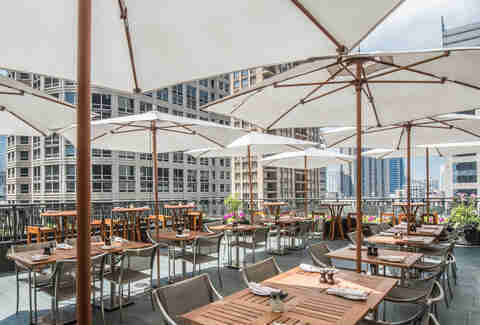 Because eating weekend breakfast indoors is just gauche, take your al fresco game to a higher level (in some cases, many levels) with a Chicago rooftop brunch. We have more than enough skyscrapers in the city, you might as well utilize them for your own screwdriver-fueled gain. 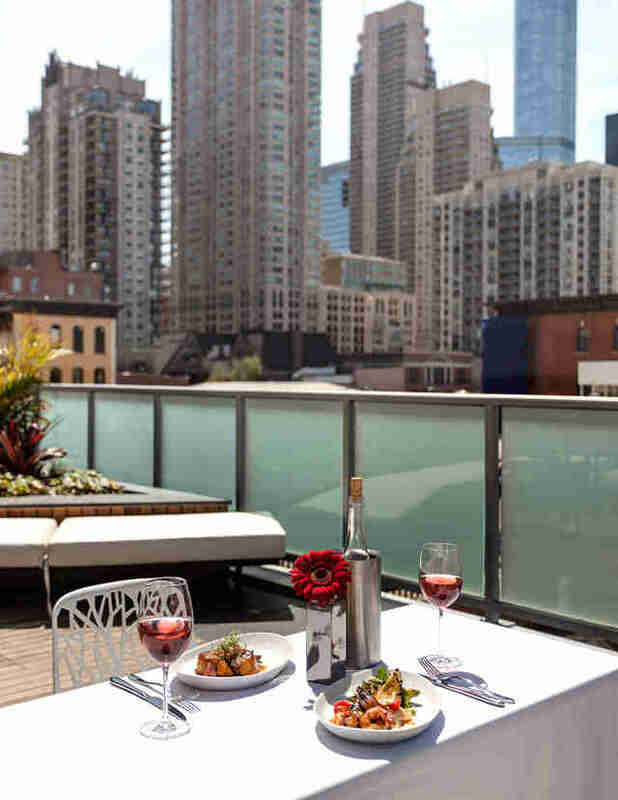 These 13 rooftop restaurants will give you brunch with a view. If you missed your chances to party Friday and Saturday and can’t get on a jet to Ibiza, Roof has you covered. Sundays here are an institution of debauchery. 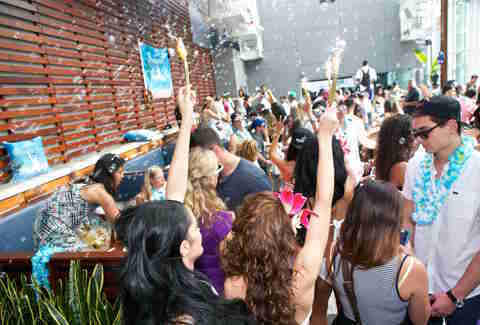 Expect go-go dancers on top of tables along with a fashion show or other assorted entertainment. The bottle service options exceed the ones on the food menu, but there are some sushi rolls, flatbreads, and shared bites to be had to keep you moving. 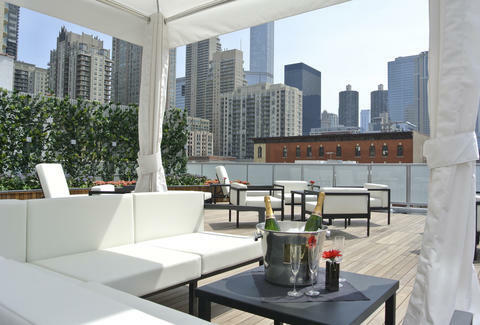 Around happy hour on a nice day, NoMI is typically full of hotel guests and Gold Coast socialites. 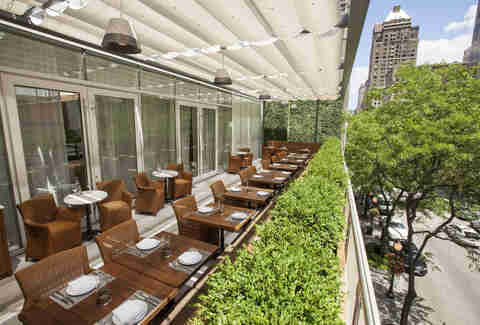 But stop by on a weekend for brunch and it will feel like your own private rooftop restaurant. Splurge on the cheese and charcuterie board to share with friends, or try the Wagyu beef meatball. Even the chopped salad stands out as perfect hot weather fare, plus the place makes a mean gin martini. With the restaurant's grand square footage, I/O’s booths have plenty of leg room to enjoy as you tackle items like lobster Benedict, smoked salmon salad, and brioche French toast with maple syrup and caramelized bananas. There’s also nothing stopping you from ordering prime beef sliders with bacon jam once you’re a few bellinis deep. 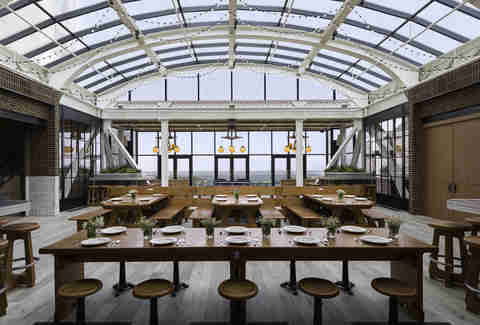 The newest entry to the Chicago rooftop scene, brunch at Cindy’s atop the Chicago Athletic Association Hotel is primed to become a sought-after reservation. Communal tables are ideal for getting the gang together with a menu built for sharing. It doesn’t get much better than the view from the terrace either, as you can see Millennium Park, Maggie Daley Park, and sailboats throughout the harbor. It even has fire pits to keep the revelry going as it cools down. Don’t expect Benedicts and waffles at this European grocer, instead think Oktoberfest year-round. 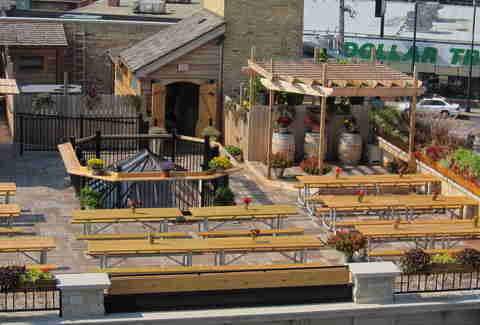 This Lincoln Square rooftop beer garden is charming and has some serious encased meat credibility. Where else are you going to get an al fresco schnitzel platter and six kinds of pierogi? 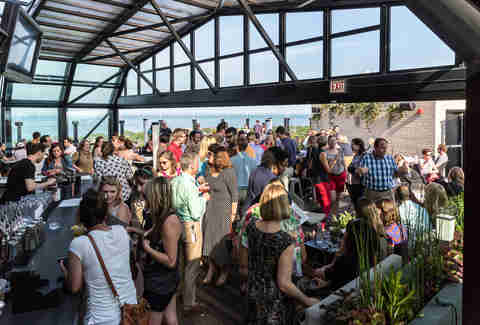 On weekends at The J. Parker, it can seem like the whole neighborhood gathers on the roof for copious cocktails with a spectacular view of Lincoln Park. The menu comes from Paul Virant from Perennial Virant (just downstairs) with solid offerings like roasted asparagus which pairs quite nicely with a Bloody Mary. This Oak Street outpost of perennially popular Fig & Olive has an extensive brunch menu and as one of the few rooftops in the Gold Coast, you might as well be feeling the breeze from the Mediterranean when sampling Chef Reyes’ dishes. For brunch, the French omelet is tops, but the branzino is perfect any time of day. Quietly exuding elegance from the fourth floor of the Peninsula Hotel, Shanghai Terrace is ideal for a quiet dim sum brunch on the weekend. It doesn’t take reservations, but you won’t have a problem finding a comfy lounge seat to call home for a few hours as you sample pork buns and almond lemon shrimp balls. Not bad for a spot that’s an ice skating rink the rest of the year. 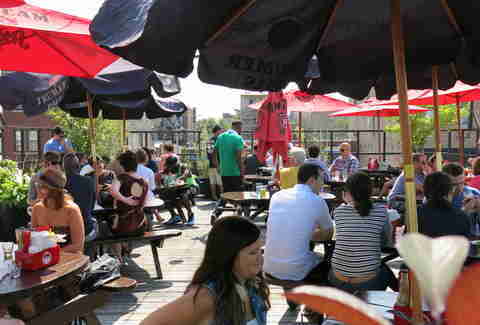 Not a spot to bring grandma (unless she’s in a biker gang), Twisted Spoke has a laid-back rooftop vibe with some of the best Bloody Marys around. 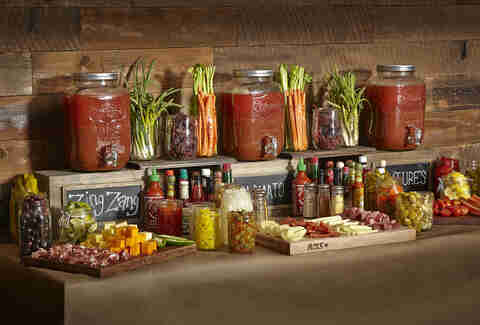 The ode to Spain, the Bloody Franco, adds sherry and chorizo with green onions and peppers to the tomatoes and vodka. You’ll need some nourishment for the marathon that is liquid-brunching here, so might we suggest the fried egg sandwich or building a burger to your exacting standards. 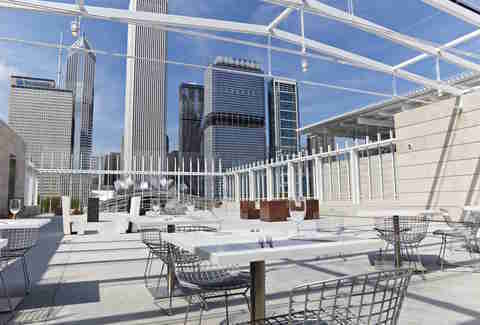 Atop the modern wing of the Art Institute you’ll find an ideal spot for a sophisticated brunch that’s exclusively on Sundays. 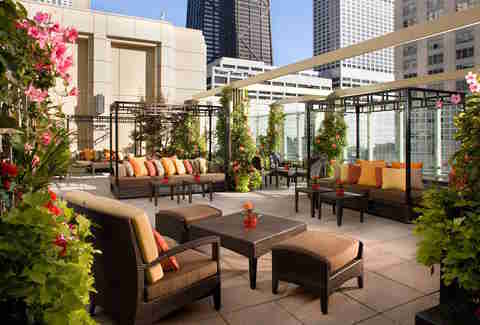 With decidedly modern décor and views of the gardens in Millennium Park, it’s a perfect spot to sip a cava or rosé. The fare is pretty traditional, with French toast and pancakes alongside flatbreads and salads, but they're perfect al fresco summer dishes. Sure it offers three variations on the typical mimosa, but Tanta proves weekends can be much more interesting with a flight of infused piscos or the famous El Chingon made with jalapeño Tanteo tequila, Fidencio mezcal, lime, and cilantro. Brunch dishes like the lomito saltado, a beef stir-fry with fried egg, all have Chef Acurio’s Peruvian flair. And you can enjoy them all on the stunning roof terrace. This spot is approachable, affordable, and most importantly, delicious. Grab a table on the roof, pick out a nice red like the Nebbiolo, and dig into a brunch pizza like the Burrata Be Killing Me or the Cheesus, Mary and Joseph. Brunch is served until 4pm in case you missed half the day but don’t want to miss out on the fun. Zed recently unveiled its revamped rooftop which is much friendlier for relaxed dining and drinking. While downstairs is a much bigger operation, the roof offers an easy a la carte menu for those afraid of commitment. Get a booth along the South wall and settle in to enjoy the farm eggs with duck potatoes and béarnaise and pair it with a nice white for a perfect weekend meal on a quiet corner in River North.